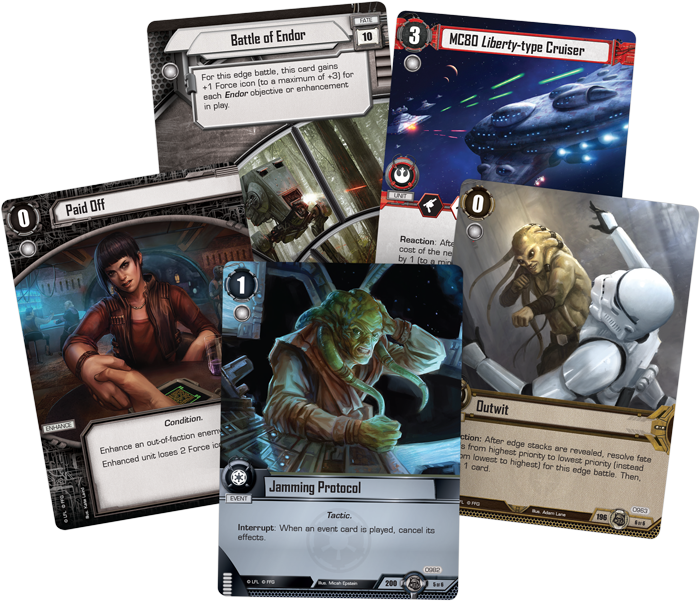 Fantasy Flight Games is proud to announce The Forest Moon, the third Force Pack in the Endor cycle for Star Wars™: The Card Game! If you’re commanding the Rebel fleet above Endor, you’ll need to deploy plenty of Capital Ships to face the Imperial Navy in battle. Fortunately, the Rebel Alliance gains plenty of massive starships in the Rebel objective set included in The Forest Moon. This objective set begins with the Solidarity of Spirit (The Forest Moon, 964) objective. 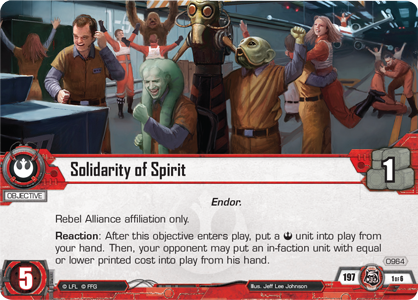 After this Endor objective enters play, you have the option to put any Rebel unit into play from your hand! However, if you trigger this effect, your opponent may put an in-faction unit with equal or lower printed cost into play from his hand. 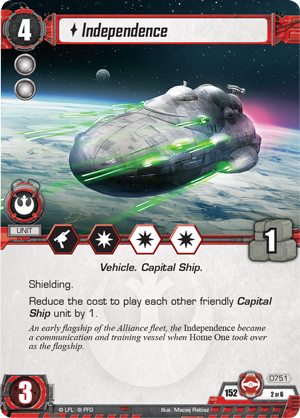 Solidarity of Spirit lends itself well to a deck based around high-cost Vehicles and Capital Ships: any time you can bring a large starship into play for free brings you closer to victory. 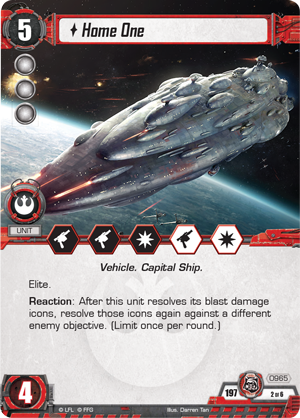 A unit like Independence (Evasive Maneuvers, 751) is especially well-suited to this effect, because it reduces the cost of all future Capital Ships that you play, and as you may expect, there are some expensive units in this set. The centerpiece of this objective set is the new version of Home One (The Forest Moon, 965). This version of Home One features the same cost as the previous version, but you gain an additional unit damage icon and an additional damage capacity. The elite keyword is shared by both versions, but this new version features a different, but equally powerful, ability: “Reaction: After this unit resolves its blast damage icons, resolve those icons again against a different enemy objective. (Limit once per round. 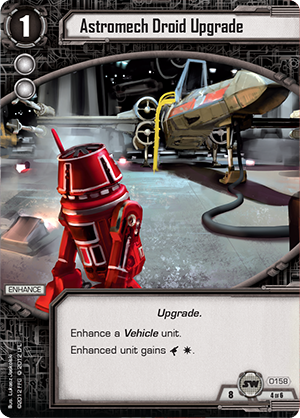 )” Rather than dealing blanket damage to each objective, this version of Home One offers a more focused offensive, especially if you can increase its blast damage with cards like Astromech Droid Upgrade (Core Set, 158) or Resupply Depot (Evasive Maneuvers, 753). Despite its power, Home One is expensive: it costs five resources. Fortunately, there are ways to decrease this cost even within the objective set. This set includes two copies of the MC80 Liberty-type Cruiser (The Forest Moon, 966). 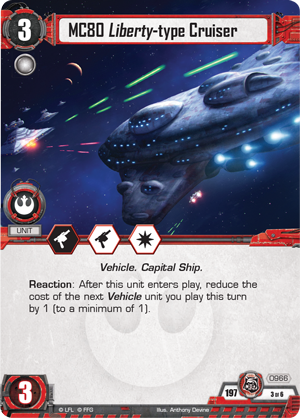 These units are dangerous Capital Ships in their own right, but after they enter play, they reduce the cost of the next Vehicle unit you play this turn by one, allowing you to grow the Rebel fleet and prepare for a deadly offensive. 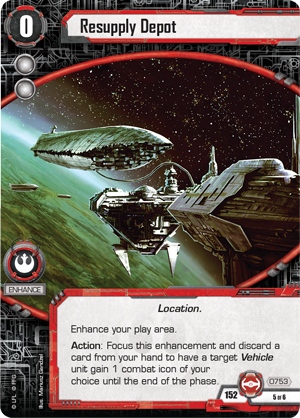 At the same time, you can benefit from Rebel Fleet Command (The Forest Moon, 967), a free enhancement that generates resources to spend on your high-cost Rebel cards. 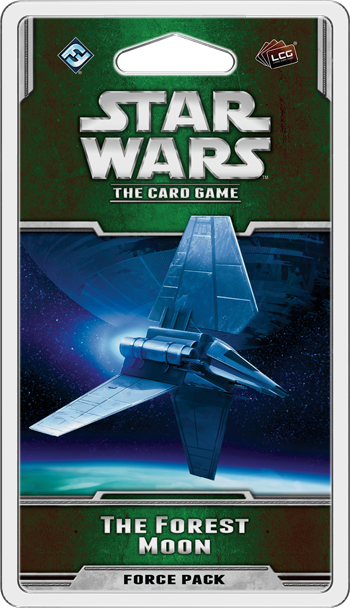 Finally, this set concludes with a copy of the Battle of Endor (The Forest Moon, 942) fate card. 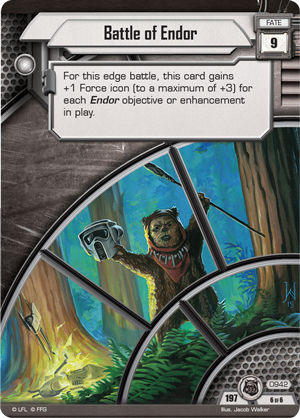 This fate card only has one inherent Force icon, but for each Endor objective and enhancement in play, Battle of Endor gains an additional Force icon, up to a maximum of three additional Force icons. 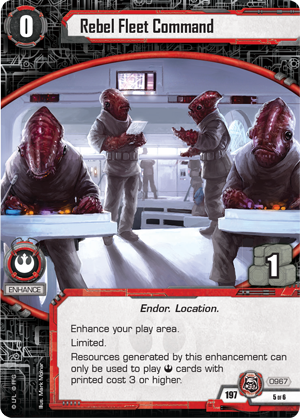 Best of all, Battle of Endor accounts for your opponent’s Endor objectives and enhancements as well, which means it has a good chance of having more Force icons than any other fate card. Look for The Forest Moon at your local retailer in the fourth quarter of 2015!